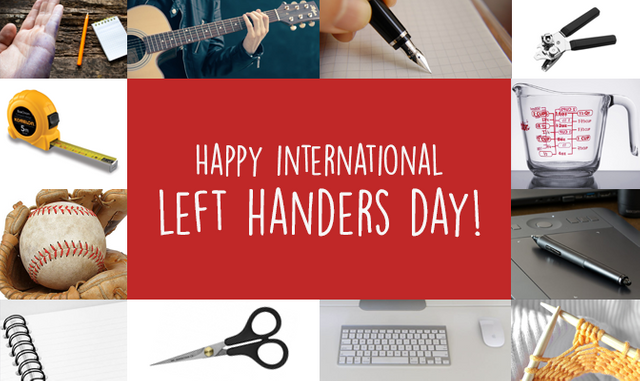 Growing up being left handed always made me feel a little different but other than with writing and during sports people would hardly notice. However, from time to time I did struggle with some minor things. Learning how to use scissors is definitely a challenge for young lefties. There are scissors for left handed people but they were always hard to find so either way you teach yourself to cut with your right hand or you teach yourself to cut with normal scissors with your left hand. A left person has to keep his hand underneath the written text because otherwise the ink will be all over the page. I struggled to do that and always came home from school with my left hand covered in blue ink. There are a lot of tools that you can just flip around to use but there a few tools that require the strength of your right hand. For example, a can opener can’t be turned around and therefore can be a little difficult to handle for left handed people. A measuring cup is little annoying when you are left handed because you awkwardly have to twist your hand so you can see the measurements. This is not only annoying for the left handed person but also for the right handed person because you’re gonna bump into each other, a lot. A lot of times you can just mirror a movement but with sports the equipment is mostly made for right handed people . At school we played softball and we only had 3 gloves available for the lefties so if you were unlucky you had to throw with your right hand. There were some advantages though because mirroring movements confuses the opponent. I wanted to teach myself how to crochet by watching YouTube tutorials. The problem was that all the good tutorials were for right handed people. The solution was a Chrome plugin that mirrored my screen. I know a lot of lefties struggle with using normal keyboards and mouses. I started using computers when I was very young so I just adjusted to using the normal setup but I never really use the numpad because it doesn't feel comfortable. For me it works better to use the normal numbers. I also own a Wacom tablet but I never really use it because I always have to drop the pen to use Ctrl C and Ctrl V and while I’m comfortable using a normal mouse I’m not when I have to use a Wacom pen with my right hand. Of course there are more struggles but these were the first things that came to my mind. What are things you as a lefty are struggling with?